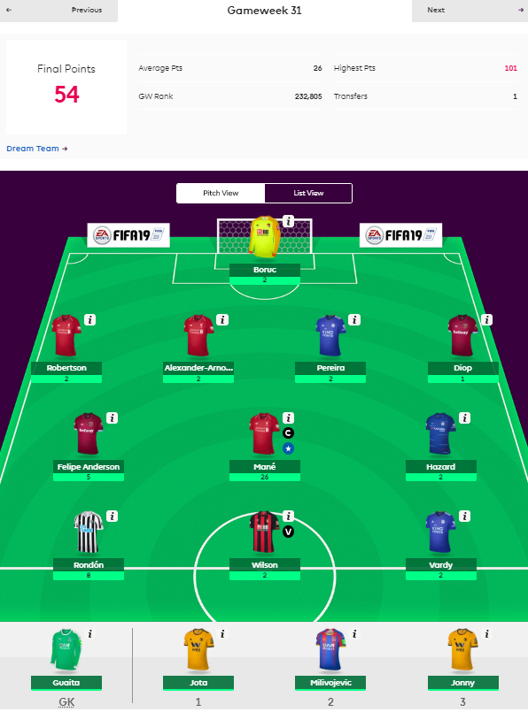 So how did we get on in Blank Gameweek 31? We've had a skip in our step at TSZ towers lately, sauntering into the office with a jaunty whistle and humming songs to the effect of "we're in the top 10k". And why not...it wasn't so long ago that things were looking grim in our inaugural season, but a remarkable upturn in form has seen us rise like a phoenix up the overall rankings. BGW31 was a damp squib for many, and for the large part it was for us too, had it not been for captain Mane providing the goods. Rondon and - believe it or not - Felipe Anderson also chipped in with something beyond mere appearance points, which meant that our score of 54 felt like a mammoth haul during a time when points were incredibly difficult to come by. 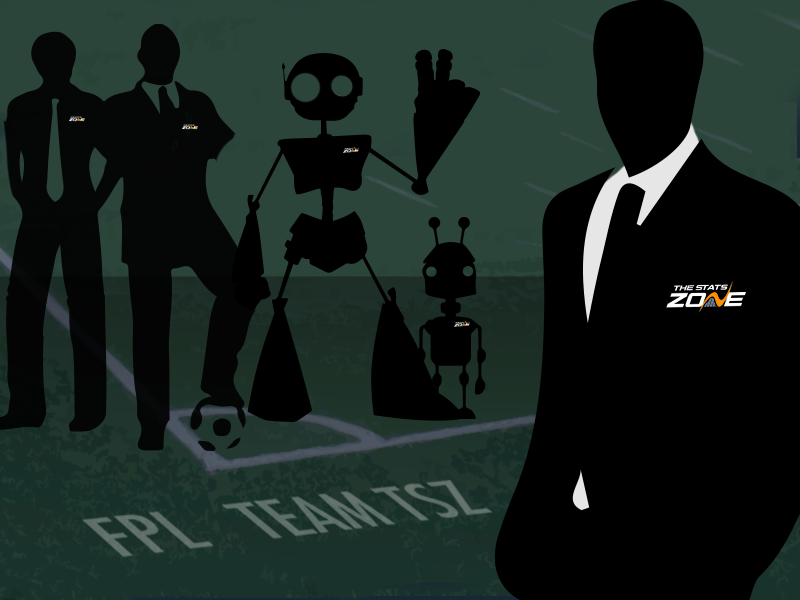 Our own mini-league is also hotting up as we head into the final stretch of the season. We are now in second place and swiftly gaining on the enigma that is Darren Whalen. Darren, if you're reading this, the transfer deadline is Sunday. Nice to see our old colleague and current FFScout staffer Neale in the mix, while I'm conveniently going to gloss over the fact that the site team has finally overtaken my personal team. So, after harping on about our amazing team, we've now decimated it with out Free Hit. That's what "Double Gameweek fever" can do to you, and we have been afflicted just like everyone else. Our motley crew feels very 'templatey', but as discussed in the community this week, this is not necessarily a bad thing. We've gone all in on Man City, Chelsea and Man Utd, with Rashford the only slight injury concern. Frustrating though it was that Ole Gunnar Solskjaer did not shed any light on the fitness doubts lingering over the striker, the man himself was good enough to post a video of some kind of back-garden routine he was going through. Read into that what you will, but if any further news emerges before Saturday's deadline, we'll consider an alternative. I say we. It'll be me. Tim thinks that becoming a father for the first time is more important than FPL, and Rob...well, god knows what transfer Rob would make. Crystal Palace's penalty ninja Milivojevic and super-hero Batshuayi make up the rest of our starters, which suddenly makes me slightly concerned that only four teams feature in our XI. We tried to shoe-horn Harry Kane in somehow, but our mediocre team value meant that too many concessions would have to be made elsewhere. Captaining Aguero seemed like a no-brainer, and for once there was little debate to be had on that front. 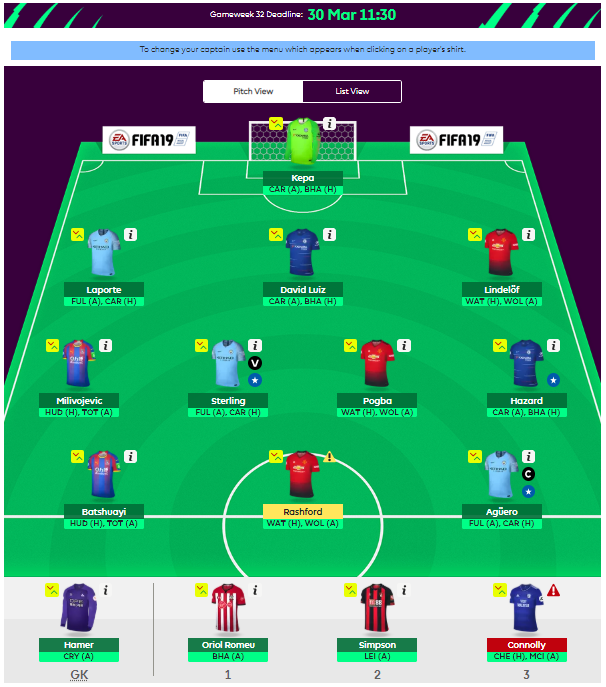 Here's to a successful double gameweek! Except for Darren Whalen.